With 360 videos, any shaking is exaggerated and becomes quite noticeable, so 360 videos benefit tremendously from stabilization. Smoovie stabilizer is a compact, pocketable stabilizer made for smartphones and small cameras (under 250g) that may also work for smaller 360 cameras. 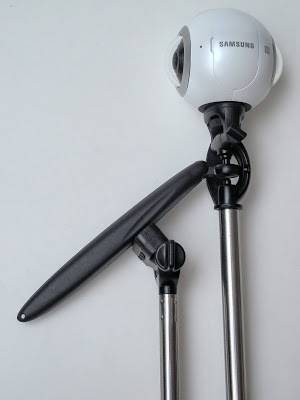 It uses a handle with a magnetized gimbal and a counterweight for stability. The basic Smoovie comes with a smartphone holder, while the Smoovie Plus adds a 1/4-20 adapter. I found the Smoovie attractive because of the relatively low price compared to other stabilizers. I backed the Kickstarter project for it and received the Smoovie Plus yesterday, around two months delayed from the planned release, which is not bad for crowdfunded projects. The Smoovie has a smartphone holder which you can accommodate typical phones (but not phablets). There’s a knob for adjusting the tilt angle of the smartphone holder. The knob also keeps the smartphone holder in place and can be removed* to replace the smartphone holder with the 1/4-20 tripod adapter accessory (with the Smoovie Plus). 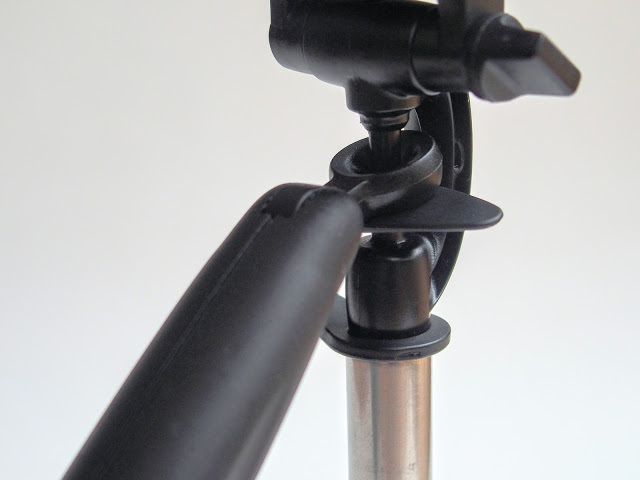 The position of the tripod insert can be offset from the center. *Tip from Jarred Sutherland: a few users have reported that the knob could not be put back after being removed. It appears this is because of a pin for the handle that can sometimes block the hole for the knob. To unblock the hole, you just need to push the pin back down from a hole above the threaded hole for the knob. 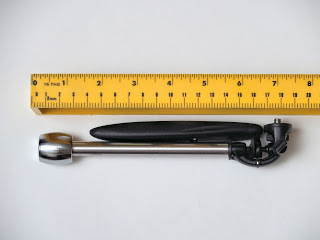 There is an all metal counterweight, which can be extended from around 6 inches to 11.5 inches. Extending the counterweight is easy, and the counterweight has numbered markings to help you set it to the right length. The Smoovie is supported by a handle with a gimbal. 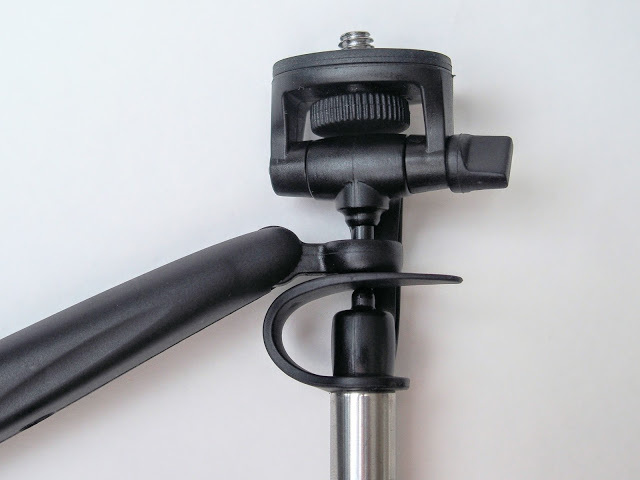 The handle has a hinge so that you can adjust the angle of the handle for high or low shots. The hinge has detents. 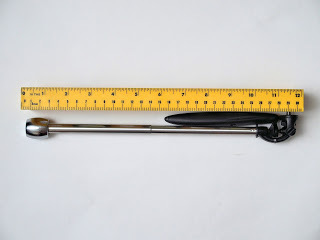 The handle also has a 1/4-20 hole in it so that it can be extended with a selfie stick or monopod. The 1/4-20 tripod hole appears to be metal. 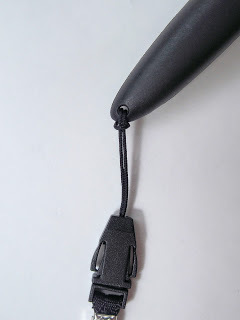 The tip of the handle has a small hole for a wrist strap, although a wrist strap is not included. The heart of the Smoovie is the gimbal. 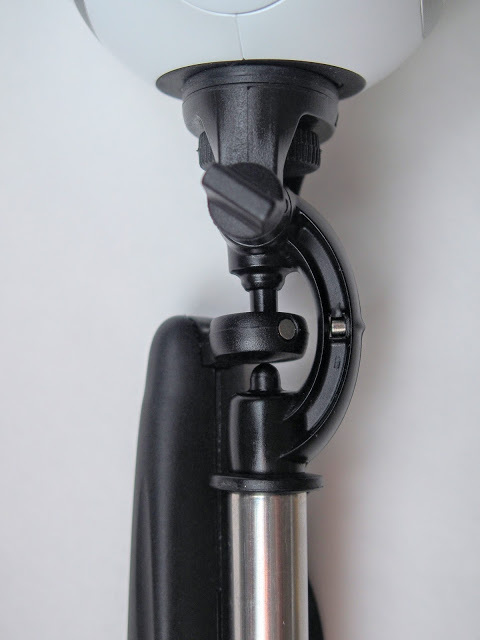 The gimbal has a lock that prevents it from detaching from the Smoovie. There are two small N42 magnets on the gimbal assembly to help stabilize the Smoovie and to allow the camera to follow any panning motion. The gimbal moves freely, and can be angled up to around 45 degrees up or down. There’s also a rubber dampener to dampen the gimbal movement. 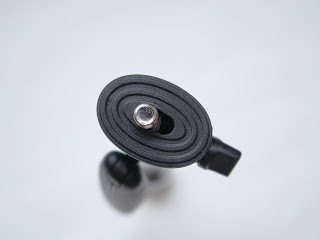 The tapered rubber dampener can be gradually removed as you become better at using the Smoovie. Using the Smoovie takes a little practice. Here are the instructions for using it: http://www.pocketsmoovie.com/video/ In summary, you need to extend the counterweight to the best length that balances against the weight of the smartphone or camera. If the counterweight is not long enough, the camera won’t be sufficiently stabilized. If the counterweight is too long, it will act like a pendulum. Once you find the best length, you can just note the mark on the counterweight’s indicator. Tip: the Smoovie can also be held above you when using a selfie stick. You just need to tilt the selfie stick attachment at an angle that is complementary to the angle of the Smoovie handle. I tested the Smoovie and compared it to just using a regular selfie stick. For this test, I used a Samsung Gear 360. 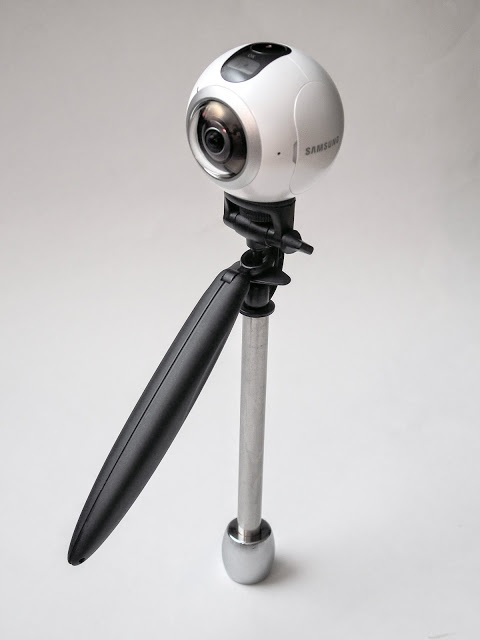 Please note that the Samsung Gear 360 can automatically apply vertical correction with the gyro sensor data and the included ActionDirector software. The vertical correction can help stabilize a shot. Note that some cameras such as the Insta360 Nano do not have vertical correction for video. Before I did the jogging test, I expected that there would be a significant improvement with the Smoovie when jogging. Strangely, it seems that when jogging, there is not as much difference compared to walking. I suspected that the Samsung Gear 360’s vertical correction mitigated the camera instability while running. In my opinion, in this third comparison, it does seem that the Smoovie is more stable than the selfie stick. The Pocket Smoovie is a well made stabilizer non-motorized gimbal. 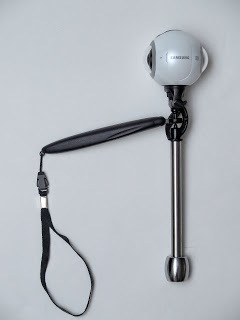 It does help stabilize 360 videos, although the improvement is less noticeable if your 360 camera has an effective vertical orientation correction, such as that of the Samsung Gear 360. Even with vertical correction however, the Smoovie does nonetheless improve 360 videos by dampening vibrations from footsteps while walking. 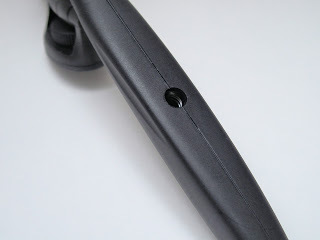 – the angle of the handle cannot be adjusted on the fly. When switching from a high angle shot to a low angle shot, you need to adjust the handle, which can be distracting in a video. Here is the official webpage. The Smoovie Kickstarter campaign has ended but at the time of this writing, it is available for purchase on Indiegogo. There’s also an identical item being sold in Japan. You may also be interested in the Stayblcam or Luuv, which also use a gimbal with a counterweight. I am interested to buy this stabilizer. However, I would like to know whether it works for iPhone with add-on lens. If possible, could you send me a small video clip being shot with iPhone+add on lens + Smoovie?